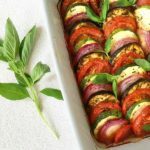 Oven Baked Ratatouille Tian, a delightful French dish that is vegan, gluten free, and so healthy. Bonus point, it it a favourite with kids, and that says all about how delicious this is. Have you seen the movie Ratatouille? It was brilliant, I loved it! Yeah, l know, it’s for kids, but l love these kind of movies. Not that the dish was not known enough, but l think that the movie really spread its fame all over the world. French people can’t have enough of it, and there’s no surprise, it’s a great combination of delicious vegetables. And that’s why l love Autumn, the season of colourful veggies. Now, there are lots of variations of Ratatouille. The dish can be cooked as a stew, or you can sautée the vegetables separately before popping them in the oven. The most commonly used vegetables are tomatoes, aubergines (eggplant), peppers, onions, garlic, but courgettes (zucchini), squash or others can be used. And then, let’s not forget about the herbs, they really give this recipe the aroma we love. Feel free to use Herbes de Provence, basil, thyme, parsley or anything you like. While this nicely arranged variation is actually called Tian, the traditional Ratatouille is more like a stew, and not that fancy looking. The taste is great, by all means, but arranging it nicely makes it even more appealing. The French dish Ratatouille can be enjoyed as a meal of its own, or as a side dish to a lovely roast. I chopped the baked vegetables finely and combined them with pasta, my little one loved it. She rarely finishes everything on her plate, but this time she did. I guess she is fussy only when is wants too. Toddlers, hey! If you have older children, they can actually help you arrange the vegetables. 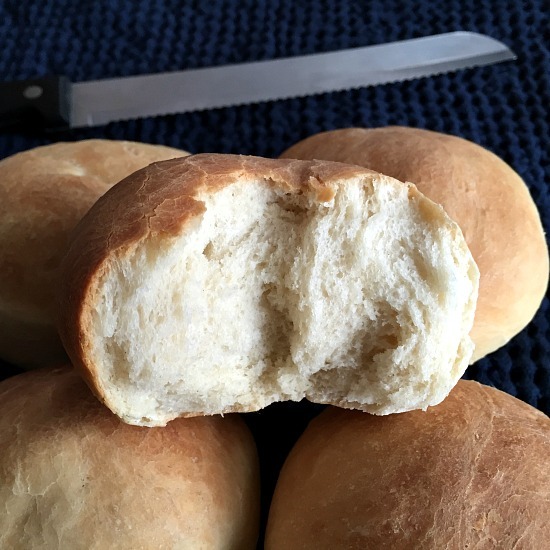 I know, they won’t look perfect, or let’s say not perfect by an adult’s standards, but it will taste as good, and the kids will get to enjoy helping you. And that’s the beauty of homemade food, it’s all about enjoying it with your family. 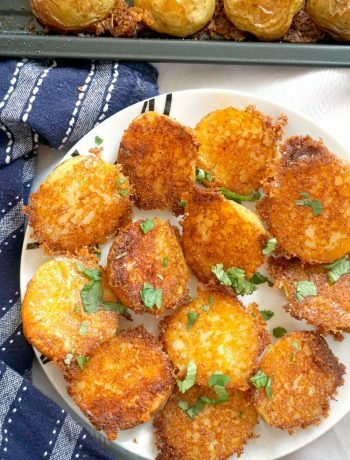 If you struggle to get your little ones to eat more veggies, you can pure these veggies and hide them into a nice tomato sauce, and that’s when everyone is a winner. My hidden vegetable sauce is always hands when little one refuses veggies. One dish, endless possibilities. 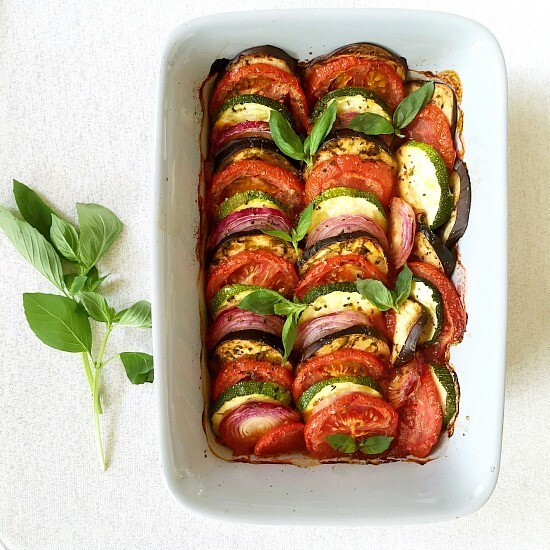 If you’ve tried this RATATOUILLE TIAN or any other recipe on the blog then don’t forget to rate the recipe and let me know how you got on in the comments below, I love hearing from you! You can also FOLLOW ME on FACEBOOK, and PINTEREST to see more delicious food and what I’m getting up to. 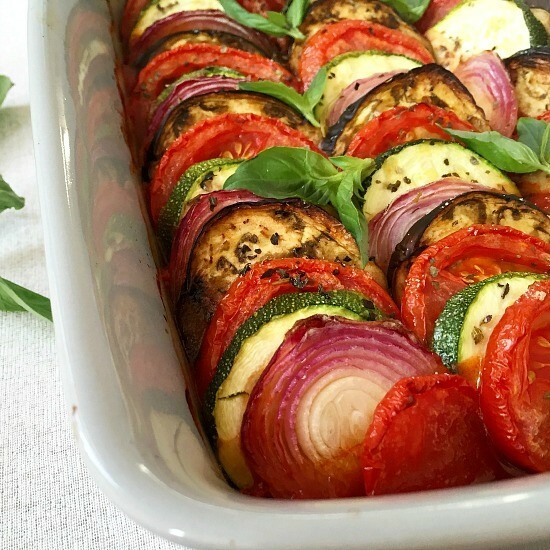 Oven Baked Ratatouille Tian, a delightful French dish that is vegan, gluten-free and so healthy. Mince the garlic cloves and chop the yellow onion finely. Mix them with the tomato passata and add the Herbes de Provence. Spread the mixture over the bottom of an oven-proof dish. Finely slice the aubergine, red onion, courgette and tomatoes and arrange them alternating a slice of aubergine, one of tomato, one of courgette and one of red onion. Drizzle over the garlic-infused olive oil, sprinkle some dried basil and season well with salt and pepper. Cover the dish with foil and bake in the oven at 200 degrees C (390 Fahrenheit) for about 30 minutes or until the vegetables are tender. 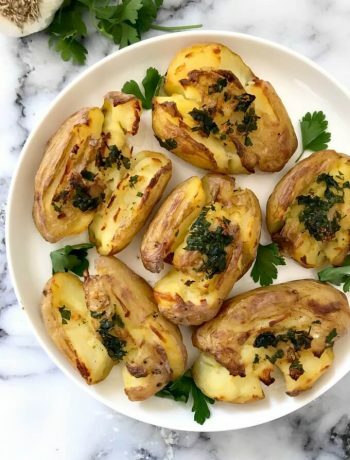 Remove the foil and bake for a further 10-15 minutes so that the vegetables can get a lovely brownish colour, but careful not to burn them if left for too long in the oven.